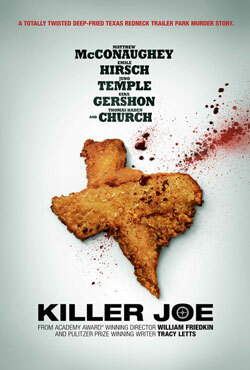 Trailer for William Friedkin’s Killer Joe Hits. Emile Hirsch, Matthew McConaughey, Juno Temple and Thomas Hayden Church star in the black comedy directed by William Friedkin (The Exorcist, The French Connection). When Chris (Hirsch) finds himself in debt to a drug lord, he hires a hit man (McConaughey) to dispatch his mother, whose $50,000 life insurance policy benefits his sister Dottie (Temple). Based on the play by Pulitzer and Tony Award winner Tracy Letts. MPAA Rating: (NC-17) for graphic aberrant content involving violence and sexuality, and a scene of brutality.